It’s not quite the DC Comics-Marvel crossover people have been waiting for, but Screenrant reports that a new Wonder Woman trailer will be part of Doctor Strange’s coming attractions. Fans got their first real look at Gal Gadot as the amazing Amazon this summer, but with the film’s release now only 8 months away, it’s high time for another preview. 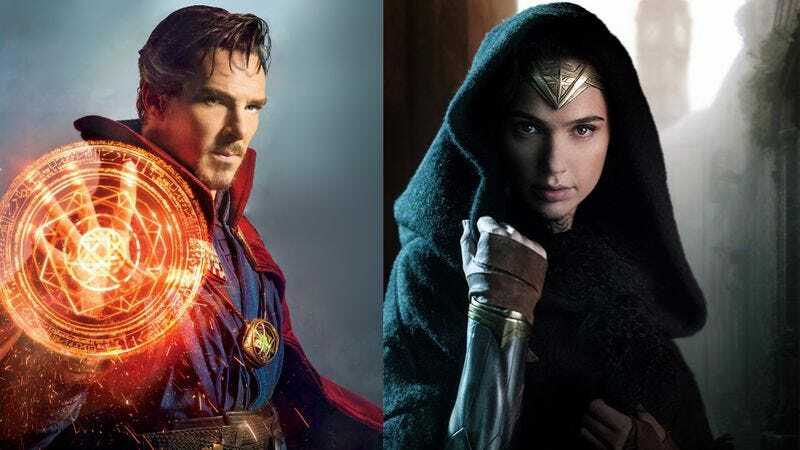 And MCU fans—or just Benedict Cumberbatch aficionados—will be among the first to visit Themyscira during Doctor Strange’s opening weekend Stateside. The latest trailer’s been classified, and its two-and-a-half-minute runtime disclosed. Now all that’s left to do is buy tickets to a movie you may or may not want to see in order to learn more about another movie you’re wondering will be worth the anticipation. But hey, Wonder Woman has been DC tested, and the trailer Joss Whedon approved. The DCEU film, from director Patty Jenkins, is the first woman-led Hollywood superhero flick this century, but Marvel’s not going to be left in Warner Bros.’ dust for long. A Captain Marvel movie starring Brie Larson is slated for release on March 8, 2019. So, regardless of which cinematic universe they prefer to live in, things are starting to look good for female fans.